Best Western Boracay Tropics Resort is a non-beachfront resort located along the main road near Station 2 of Boracay's famous White Beach. The resort features a mix of Mediterranean and Asian architecture surrounded by a lush tropical garden of towering palm trees. Right in the middle of this verdant property is the resort's bean-shaped pool that offers guests with a refreshing escape from the summer heat. Upon check-in at the resort, guests are welcomed with a Boracay Tropics' signature beverage, the Cucumber Slush, and a welcome lei. The combination of the sweetest mangoes and the refreshing cucumber was very addicting! 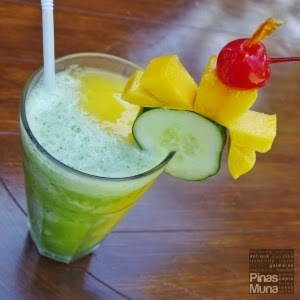 I ordered a glass of Cucumber Slush (P110.00) every morning of our three day stay at the resort. After finishing our drinks, we were assisted by the staff to our room. Boracay Tropics has six room categories: Superior Room, Deluxe Room, Dorm Room, Family Room, Premiere Suite, Junior Cabana, and Superior Room. 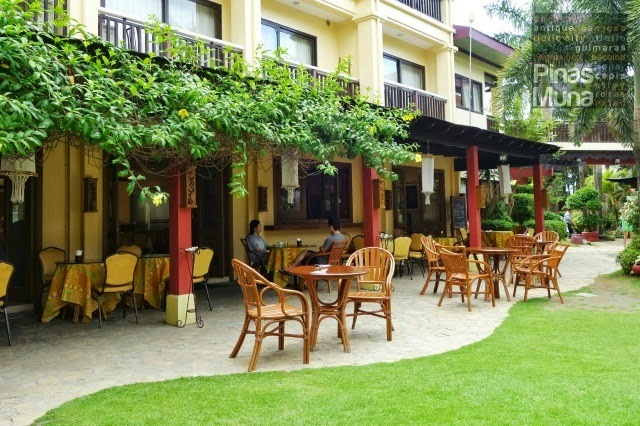 Rooms are well appointed and are designed to accommodate groups of different sizes. We stayed in a Deluxe Room which is furnished with two double beds, a writing desk, and a closet. The room was equipped with an individually controlled air-conditioner, a cable-ready LCD TV, a minibar, a coffee and tea making facility, and an electronic safe. Our room also had a veranda facing the garden and the swimming pool. 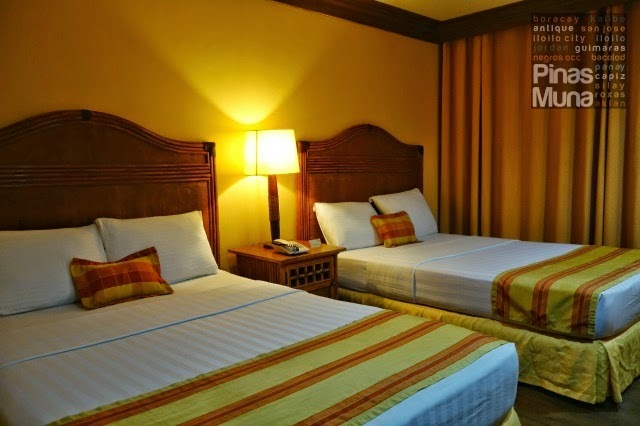 The room is ideal for two persons or a family with two kids. Our bathroom was sufficiently spacious and clean. It had a rain shower that runs hot and cold water. Water pressure was excellent. Our toilet had a bidet installed. Clean towels and basic toiletries such as soap, shampoo and dental kits were provided. 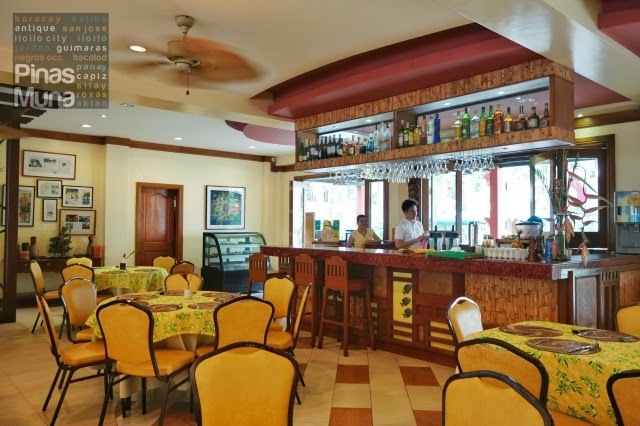 Tropicafe, the resort's in-house restaurant, offers a wide range of Filipino, Asian and international dishes that are not only delectable, but very affordable as well. During our stay, we didn't bother looking for other restaurants on the beachfront anymore. We enjoyed the convenience of dining at the resort and feasted on some of their signature and best-selling dishes. Most noteworthy of all the dishes was their famous Pata Tim (P425.00). The pork leg was slow cooked allowing for all the flavors of the sauce to be infused into the meat, resulting to a super tender meat that falls off-the-bone. The dish also had a well balanced flavor of sweetness and Asian spices. It's perfect with steamed rice and a cold glass of soda. Tropicafe also serves a variety of alcoholic and non-alcoholic beverages. In addition to the Cucumber Slush, we also tried other fruit shake flavors such as mango, pineapple and strawberry. A visit to Boracay is not complete, especially for our foreign guests and first-time visitors, without swimming at its famous White Beach which is accessible from Boracay Tropics through a 5 minute walk. Having visited all 81 Philippine provinces, we can say that Boracay's white beach does have the finest white sand in the Philippines. After a day of swimming and fun outdoor activities at the White Beach, we headed back to the resort to get pampered with a whole body massage. Guests can avail of the massage services at the Oasis Spa or at the comfort of their own room. Let the resort's well trained massage therapists soothe your tired legs, back and arms. Feeling relaxed and rejuvenated, it's time for more swimming, this time at the resort's bean-shaped swimming pool. Feel the weightlessness of your body in the pool's warm water and have ice-cold beer or fruit shake served to you at the pool. What a great way to cool down the evening in this tropical island resort. After that swim, I'm sure your tummy is ready for yet another appetizing treat at the Tropicafe. Make your dinner extra special by requesting a luau style dinner set-up at the resort's garden. Having this set-up is free of charge, just inform the restaurant ahead to give the staff enough time to prepare. We had several dishes that night but what stood out was the Seafood Tropical (P380.00) which is a mixture of various seafood including shrimps, fish and mussels plus vegetables and chunks of pineapples. It's has a light creamy taste and the pineapples added a sweet and refreshing lift to the dish. We also tried some of their cocktails. I had my favorite Screwdriver, a simple cocktail made of fresh orange juice and vodka, really perfect for the tropical weather. It was a special evening for me because my friends secretly arranged for a cake sneaked to our table by the staff. It was a heart-felt post-birthday celebration that I really enjoyed. To my friends, thank you very much! We stayed a little longer at the garden enjoying the cool breeze and the clear sky of that evening. What I enjoy a lot when in the province is stargazing. There's just so much stars visible in the sky and that is something you too can enjoy during your stay at Boracay Tropics. We had such a long but fun day, and it's finally time to get some sleep and recharge for yet another day in Boracay. Our ultra comfy bed is just what I needed. With the aircon on and lights off, I leave you for now while I go for a deep slumber under my sheets. Tropicafe serves a wide selection of breakfast items on the buffet table, and during our stay, we observed that they change the menu everyday. I grabbed some bread, pasta and eggs from the buffet table and joined my friends having breakfast by the garden. It was a busy morning. Guests having breakfast while other guests were having their morning swim at the pool. New guests were constantly arriving, while other guests were just finishing off their breakfast before checking-out from the resort. 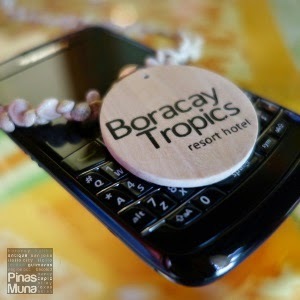 I never thought that I would enjoy staying in a non-beachfront resort such as Boracay Tropics. It is the serenity of the place, of its garden, its wide open spaces, the fresh air, its cozy rooms, the great food they serve, and the genuine Filipino hospitality of their staff that sets Boracay Tropics apart from other resorts in Boracay. Overall, Boracay Tropics is a good choice for families and friends looking for quality accommodation at budget friendly rates. It is perfect for those who want to stay away from the crowded beachfront and prefer wide open spaces with lots of greens and fresh air. It is perfect for big groups looking for a venue to hold their functions away from the distraction of the highly commercialized beachfront, but still located in a short walking distance should they want to unwind by walking on the powdery white sand of White Beach. Ang ganda ng pool especially sa gabi! Great photos!